The day view of the finished flag The night time view. An act of terrorism on September 11, 2001 caused many of us to face fears and emotions that we had not known before. The amount of damage, devastation, the loss of lives and our fear was of an amount that can not be fathomed. Such fear and terror can not easily be understood and dealt with, so we do the best that we can. How do we explain to our children that to overcome this we must Pray and find ways to show our county our support? How can we pray? Thankfully, the Holy Spirit has descended to us once again to deliver our prayers to God. Only he can interpret what we can not put into words. The Holy Spirit will bring all of our petitions to the Lord God. We Praise God for that. How can we show support? The practicality of the situation prevents most of us from arriving at ground zero to give any type of help. We can give blood, we can give money, we can send some material things and we can give words. The best thing that we can do, not only to show our support, is to engage ourselves in a positive and healing way, and to show our patriotism. Our family looked for an American Flag to purchase in order to fly over our home so that we, too, could show our support. No flags were available. That brought a sense of failure and also a determination to find a way to still be patriotic. Our son decided to paint flags and patriotic statements on his SUV. That was what he needed to do to let everyone he knows and who sees him understand his feelings. When I picked up my daughters from school, they lamented that "old people don't think teenagers can understand what is going on". This caused a great deal of stress for them. I put the two situations together and suggested that we could do something! It would not be much, but it would give us a chance to show our patriotism and do something. We decided to paint a flag on our barn. That was a great focus for our family that first weekend after the attack on the World Trade Center in New York. I found a vexicollogy page on the Internet and used the ratios of the Navy's requirements for the measurements of our enormous flag. 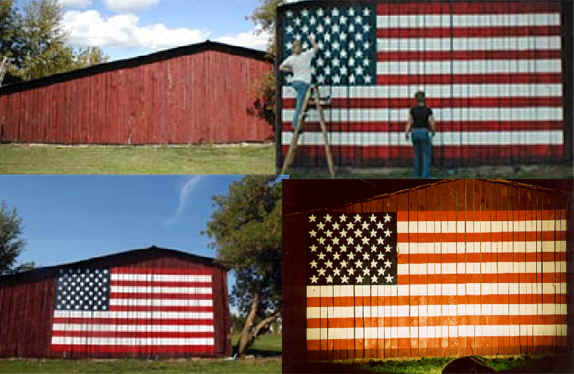 The size of our flag is nearly 10 by 20 feet, which is not enormous, but it is the right size for our barn. We calculated, measured, snapped chalk lines, drew stars, and started painting. We all wanted to do our best. WE all decided that we wanted our show of faith in America to be preserved for as long as our building could stand. Hopefully, we did it right. What does this procedure mean to us? After all of the things we found we could not do to help, we decided that we could pray and support. I hope that the message says that we support America, our Government, our President, our Military and our Citizens. In our own family, we have ancestors that arrived on the Mayflower. More followed and all but one of our lines, fought in the Revolutionary War. These forefathers left their own countries for the simple purpose of Liberty! They gave up all that they had to ensure that their children, grandchildren and all of their descendants would have a chance to keep Liberty valued and strong. For these great purposes, this family wants to show that those values are still on the forefront. WE want to keep America Free. Keep Liberty Alive and keep Patriotism going forward. The act of terror has drawn our country together. We have overcome political, religious, ethnic, and other barriers in order to focus on the importance of what happened on September 11, 2001. This abominable act of cowardice has brought the strength of America to the front pages of every newspaper around the world. This act of destruction has helped to bring many families and communities together in spite of all the conflicts it was meant to create. This act of evil has brought many of the faithless, the hopeless, and the lost to our religious centers for comfort, rest, peace of mind and encouragement of body. Perhaps a part of the terrorist plan was successful, the buildings did fall, but we will not. Our daily lives go on. The Government continues to govern, the workers work, the teachers teach, our courts, our hospitals, schools, homes, farms and our lives continue with a renewed sense of purpose. A sense that together, we can overcome, survive, and perhaps even grow as a family, a community and a nation. Someone is getting married. Another is rejoicing in the birth of a much wanted child. Graduations, promotions, goals met in spite of the terror that was hoped would befall us. Life does go on. We need to bond together with our neighbors and present a feeling of security to those of different ethnic and religious backgrounds. WE are all Americans. We must not place the blame on an entire nation, only the one and his accomplices who are truly responsible. We need to make sure that we hold neither religion nor governments responsible for this act of terror. Our flag let us show our feelings just a little bit. Red, White and Blue. The colors of America. The colors of Liberty for all people. All from a little flag we painted on our barn. The flag was finished exactly one week after the attack. The Midland Daily News came out and did a story, took pictures and complimented our painting. That evening, we placed a light on the ground and focused it on the flag. The farmer cut his cornfield down just as we were finishing the flag painting. Almost like an unveiling of our work. It presented an amazing sight from the road about 1/2 mile south of us. Our flag, with the light shining on it, looked as if it were glowing and floating above the field. It was an emotional and awesome vision! Every car that passed by honked his horn loud and long in positive support of what we were doing and what the American Flag meant to them. It was amazing! All because we painted a flag. It was so interesting and so incredible that during the next few weeks after the attack and after our flag was in the paper, so many "neighbors" from down the road or around the corner stopped by to introduce themselves and tell us how proud they were to see that illuminated flag each time they passed by. Not that WE had painted it, but that it was their flag. People stopped on the road to take pictures all times of the day and night. We got nice phone calls and even a letter from people saying thank you for making that statement and allowing them to be reminded of its meaning each time they passed by. Our flag has become a symbol not only for us, but for our whole community of Mills township. Last evening, I kept hearing cars passing by and honking their horns. I didn't know if a pet was playing near the road or not but I didn't think much of it. After realizing that many cars were honking over a long period of time, I saw that the light was off and not shining on the flag. We fixed that quickly. I didn't realize just how much pleasure the painting of that flag has given all of us. WE are proud of our flag, proud to be Americans and proud that our friends and neighbors agree.